That’s not how you remember that meme? Huh! You might not live in Germany! In Germany, early December is a time of great anticipation. 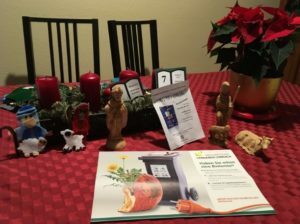 Among other events, like Advent wreaths, Saint Nicholas Tag (think: “Santa Claus is coming to town”), and Nativity sets, is the much anticipated, eagerly received, all-important TRASH calendar for the coming year. Within the pages of this calendar, dedicated to trash, one can find information both useful and nauseating, all about the subject of trash. Need to know how to dispose of a refrigerator? Yep, that’s in there. How do I dispose of fluorescent light tubes. Look to the calendar! Need to know the hours of the local trash disposal “house?” That’s there too. Is tin consider Altmetal? The Trash calendar will tell you! Need to find the closest three sites for “green” trash–grass clippings, garden trash, and small branches?? Absolutely!! Trash, trash, trash, ad nauseum! The Trash calendar is a real calendar. Just like a real calendar, the Trash calendar arranges the days of the month according to the pre-set pattern of years, based on the Gregorian calendar. The uniqueness of the Trash calendar lies in the special information it contains about the schedule of trash collection. Centered around the concept of sections, boroughs, or districts (German: “bezirke”, singular “bezirk”), the calendar will indicate the exact day of a specific trash-type pickup in the area of your residence. What do we learn from this? Proper trash etiquette is important in Germany. Never put recycling out with green trash. Don’t put brown glass in the green glass bin. If you don’t have a paper / cardboard bin, it is acceptable to tie your recyclable paper in brown twine. It must be Christmas time. The 2018 Trash calendar has arrived. Let the festivities begin!